When it comes to maintaining healthy skin, blackhead removal is quite difficult. These blemishes are hard to remove. 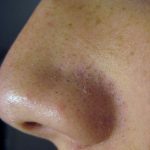 Despite the difficulty, there are some tips that people find helpful when it comes to preventing and getting rid of blackheads. Technically speaking, blackheads are referred to as comedones. These bumps look like little plugs. The confusion of white heads and black heads have to do with the fact that white heads can be present on both oily or dry skin while black heads are only present on oily skin. What are Blackheads are caused by? A clogged pore due to excess oil on your skin is the culprit to your blackhead problem. When your skins oil is unable to flow to the surface and is blocked by dead skin, causes the clog. When the oil is exposed to oxygen it causes it to turn black, resulting in blackheads. The main cause of increased oil on your skin is due to hormones. With an increase in androgen, men will experience an increase of oil production on their skin which causes more oil build up in their pores. The increase of oil build up causes a greater appearance of blackheads. Another factor that causes blackhead appearance on your skin is the use of make-up or skin care products. These products often mix with your natural oil on your skin and add to the build-up in your pores. The formation of both black and white heads is increased due the combinations mentioned above. When it comes to blackhead prevention, there are a few things you can do. Some options consist of medication while others involve cleansing. When it comes to black head prevention you want to avoid using thick, greasy, and creamy products. By avoiding these types of products your chances of developing blackheads is lowered. You want to use a water-soluble that is gentle acne cleanser. You want to avoid using a bar of soap. The ingredients in a bar of soap clog pores. Bar of soap can also cause your skin to peel or flake off prematurely which also clogs your pores. If your skin is dry you will need to use a moisturizer cleanser. When using this type of product, the moisturizers in the cleanser can increase the amount of oil on your skin. In order to eliminate the dead skin cells you want to exfoliate. Oil can freely flow through your pores when there are no skin cells to block it. When you exfoliate your skin, you are removing the dead cell buildup from within the pores. This build-up causes your pores to become clogged and misshapen. By using an exfoliate that contains BHA or Salicylic Acid at 1% or 2% it can penetrate the lining and clean out your pores. If for some reason you can’t use BHA’s, you can use another product that contains Alpha Hydroxy Acids. The only difference between AHA and BHA is that AHA doesn’t clean beyond the surface. If you have excess oil you need to find a way to absorb it. An option you can try is a clay facial mask that doesn’t contain peppermint, mint or other irritating ingredients. The facial mask absorbs any oil that may clog the pores. If your skin is dry, using a facial mask to remove the oil is not necessary as the oil that causes the black heads are found within the pores. Using an oil-absorbing paper can decrease the oil found within the pores. You may have to visit a dermatologist. Retinoids help regulate the shape of your pore allowing for normal flow of your skins oil. Retinoids are found in prescriptions such as Tazorac, Renova, Differin, Retin-A, and Avita. There are other medications you can take such as a low-dose birth control or hormone blockers. The most popular method of removing a black head is by simply squeezing them. Make sure to do it gently. By removing the contents of your pores helps relieve the pressure that is causing the damage. It’s impossible to ignore a blemish so here are tips for gentle, healthy blackhead removal. 1. With a clean towel, dry your face. You can use a mild scrub to remove dead cells from your skin while exposing the blackheads. 2. Make sure to pat your face dry. 3. For 10 – 15 minutes place a warm compress on your skin in order to soften the blackhead. This makes it easier to remove it. 4. Dry your face again by patting it dry. 5. Make sure to protect your skin by placing tissue on the tips of your fingers in order to avoid them slipping as it would cause damage to your skin. 6. When you found a blackhead you want to remove, apply gently even pressure to both sides of the blackhead. Press down around the blemish. You want to apply pressure from beneath the blackhead. If you are unsuccessful after a couple attempts then don’t continue as you can damage the skin by either scarring or bruising the skin. By reading the warnings on the box of pore strips you’ll be told to not use them on irritated, swollen or sunburned skin, not on dry skin or any other area of your body other than the nose. The warning also states that you should add water to the strip it if it’s too difficult to remove. Pore strips only help temporarily. They remove some healthy skin along with superficial blackheads. Irritation and further breakouts are a result of the repeated use of pore strips. The pore strips contain an adhesive that can injure the skin by tearing it. Your odds of having your skin damaged is increased by the use of any medications mentioned earlier in the article or if you have thin skin. Blackhead extractors and vacuum blackhead removers are not recommended just like the pore strips. Clog pores caused by excessive oil production causes blackheads so the most effective way to rid you of blackheads is to control the oil by using mild cleansers and balancing hormones.